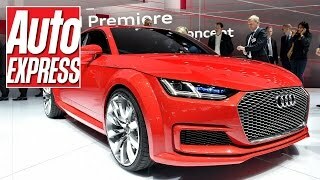 The 2014 Paris Auto Show cleared Audi’s intention and also gave wind to the already sensationalizing verdicts about Audi looking ahead to expand its TT range. 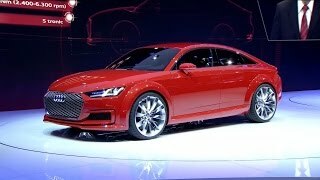 Audi named its third concept as Audi TT Sportback Concept 2014 and thus in the very same year this turns to be third concept from the house of Audi. Let us see what Audi is looking ahead to present its customers through its TT range. Interior of Audi TT Sportback Concept 2014 upon first glance itself gives a serene impression and you can feel the thirst to spend some time in there. Parchment colored diamond quilted leather covers the bolstered seats of TT Sportback Concept 2014. Following the same color trend dashboard and upper door trims mark their presence with grey leather. The dual tone look of dark-grey and grey adds a little sporty essence to the interior of Audi TT Sportback Concept 2014. Apart from this sportiness model also gets blend of class with the use of Alcantara over door shoulders. Now talking about features, traditional MMI monitor gets a replacement by all new 12.3 inch digital instrument cluster, controls of the cluster are mounted over the steering wheel. 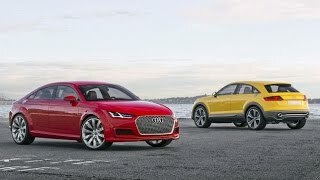 Just like the interior, exterior of Audi TT Sportback Concept 2014 holds resemblance with the base TT Coupe but a closer sneak will bring some new modifications into your notice. 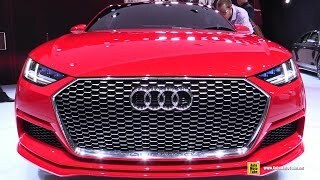 Starting with the front fascia of Audi TT Sportback Concept 2014, widened honeycomb grille is the first difference coming into your notice, giving the Sportback Concept a widened sporty look. Moving ahead the headlights, front apron featuring single piece lower air intake and the bonnet drags your attention towards its sporty aggressive profile. Moving towards rear fascia of Audi TT Sportback Concept 2014 taillights match the glory of headlights and thus giving a remarkable presence of car on streets. Another in the queue is entirely different bumper incorporating oval shaped exhaust pipes. Audi TT Sportback Concept 2014 gets its power through a 2.0 TFSI engine delivering 400 hp and 450 nm torque mated to seven-speed S tronic transmission. Engine comes in model with Audi’s Quattro AWD system, thus the pair brings a powerful and smooth ride experience. With these statistics the Audi TT Sportback Concept 2014 is capable of finishing the 0-62 mph sprint in just 3.9 seconds. This means while in this model, the arena outside will move away from eyes with a blink.